Two years of doing battle with the media, Republican insiders and the hating left has conditioned Palin supporters into becoming "trained" political fighters with fast reflexes. Their rhetorical weapons have become razor sharp and their abilities to use them have become surgically precise. The sword unsheathes swiftly. The laser fires directly at the target. The time between aiming and pulling the trigger has gotten shorter. On Hannity Thursday night, Karl Rove pointed out how he was attacked by Palin supporters after his “gravitas” comment. He responded by pointing out that “I am a commentator.” In response to his “war wound,” Rove suggested that Palin supporters not be so thin skinned, and that there will be many hits to come if Palin wants to be president. There is an important lesson to be learned from this for all involved. The political battlefield is littered with television, radio and print journalists who have been hit, and hit hard, by the Palin army. Yes, what Karl Rove has said since demeaning Christine O’Donnell until now has been offensive to Palin supporters. And yes, the response has been swift, hard and on target. This blogger among many has held no punches and didn’t flinch in the face of past loyalties as a Bush supporting Republican to stand between Sarah Palin and an oncoming truck, even if that truck was being driven by Karl Rove. Rove was trying to be an analyst and the Palin army was simply doing what they reflexively always do: jump to the defense of their beloved Sarah by shooting first and taking names later. In defense of Karl Rove, it's understandable that he would want to be a fair analyst and provide his insight and opinion if indeed he is trying to be constructive. If his motive is genuine, let’s hear him out. His statement that he was not taking a punch at Sarah Palin tells us that he felt the arrows and the steel of the Palinista sword. Does Rove have a Republican insider uniform underneath the suit? Could he be worried that one of his more favorite candidates might not get the nomination because of her? Sure. But we should leave it up to him to show us whether we’re right or wrong about that. If he really wants to be a fair balanced commentator and not allow an agenda other than a conservative Republican victory be his guide, I say let him report and we decide. Now, don't wander off here, readers. There are some good things to be said about this from a Palin perspective as well. Rove advised us not to be thin skinned. There is an explanation of why he may misread Palin's supporters here. The last time we let nature take its course, a Katie Couric interview, a Charlie Gibson sit down and a Tina Fey impression nearly killed Sarah Palin before anyone on the Palin side even had a chance to put up a post about it. We hear the criticisms of Palin supporters. Palin supporters are intolerant of any criticism whatsoever of their exalted high leader. Palin supporters ignore Palin’s flaws. They worship her. Palin can do no wrong. I hear it. I get it. I understand it. So now let me explain it. We have been in the political desert since Ronald Reagan left the stage in 1992. We have been thirsting dreadfully for his message, his vision and his dream. It was the darkest moment in the history of modern conservatism when moderate John McCain wrapped up the nomination and was doing rallies in front of sparse and yawning crowds. Speaking loudly enough to be heard above the crickets, Senator McCain spoke about straight talk and being honest with the American people. At the same time, we were being honest with ourselves. We knew it was coming. We knew we were about to get our butts kicked by the Democrats and that socialists would not only take over the country, but destroy the conservative movement in the process. The Left knew it. They knew she was a game changer. They also knew they could not beat her in a debate on the issues. Knowing this, they chose the politics of personal destruction as their tactic. They told us she was dumb, shallow and not intellectually curious. But that was only because they wanted us to believe that over the truth. They unleashed one of the most vicious smear campaigns ever in the history of American politics and it worked. It’s still working now every time you hear someone say they like Palin but don’t think she can win. To beat the media smear campaign, we need to beat that kind of subliminally planted response. The response to overkill is overkill. With Palin's documentary, her appearances on Fox News, her Facebook notes and the proliferation of pro-Palin websites and blogs, the answer to tons of negative sand is tons of positive sand. Push Palin's good stuff into a pipeline stuffed with the Left's bad stuff and we can displace it. We can’t forget what Sarah did to enamor the base when she first hit the political stage. But, the Left wants us to forget. They want that magic to be watered down by focusing on a couple of mistakes along the trail. This is their way of diminishing people's abilities to make an informed decision about who they want to be president by planting the seed of doubt in their minds. Remember, we were all thirsty political desert wanderers on the brink of dehydration and she gave us water – lots of water which we still drink today. Regardless of what any Journolister, nightly news anchor or Washington Post writer tells you, that water is still good to drink. Those who support Palin are not in a fan club nor are they in a cult. They are in this for the future of our country. Some may say they blindly follow her, but that’s not true. If there was someone truly better than her out there, they’d be behind them. There are Romney supporters, Hillary Clinton supporters, Giuliani supporters and people who voted for other candidates in the 2008 primaries who will not be voting for those candidates in 2012 for the simple reason that there was no Sarah in 2008. For the record, this writer was a Romney supporter then (although I would have taken Fred Thompson more seriously if he was more viable). It’s not that Palinistas are blind to the fact that Sarah Palin screwed up a couple of Katie Couric’s questions. It’s not that they are blind to the fact that she was a little shaky on the Bush Doctrine. And, it’s not that they're not humorless. They understand comic license. They have senses of humor. If Tina Fey wants to turn Palin’s comment about seeing Russia into a satirical mock, that’s fine. The problem is not Tina Fey's delivery or with the interview questions themselves, but rather in how the media treated these in relation to the wider picture of a campaign where there was so much more substantial stuff that could have been scrutinized under the same microscope on the Obama side which wasn't. As for Fey, the answer is to infiltrate the pop culture a la Bristol style. As for the rest of the media, let the light shine and the facts will come out. Any reasonable person can review the historical events of the 2008 presidential campaign and realize how miserably the media failed to portray what was happening accurately. A couple of missed answers during an interview simply cannot outweigh lofty hidden left wing agendas, ACORN voter fraud and socialist associations (and don’t forget the numerous gaffes and misstatements of Palin’s counterpart which didn't get a fraction of the coverage or mocking that Palin's lesser miscues did). There was no one there to defend the movement or Palin until people figured out later what the complicit media was trying to do. The McCain campaign tried to take the high road and have thick skin. But that got them killed. Standing up and pointing out that there is something wrong with the way the media is doing its job is not whiny if the future of our republic is being jeopardized by liars, partisans and those who don't have the interests of the country's Founders at heart. The attacks, lash backs and sharp tongued responses to the media from the Palin camp were manifested out of survival instincts that kicked in not only because of the media malpractice during the 2008 campaign, but continued well after the 2008 election was over as the vicious unwarranted attacks on Sarah Palin continued. It's understandable that this may appear as being thin-skinned to Rove who may not have been clinging to his computer by his fingertips the way Palin supporters were during the pounding that she took between November 2008 and July 2009. In fairness to Rove, Palin supporters are in a much better and stronger position now to pick and choose their battles. So in that respect, they should navigate it better and not give Rove as much to say on the subject. Palin supporters have to walk the fence of being happy and above the media fray while at the same time remaining swift and harsh in rebuking it when no one else will. Karl Rove has said that it's how candidates respond to the media that will be more important in 2012 than what the media says. He himself admits that he wished he would have fought the smear campaign against George W. Bush harder. If there is a role for Karl Rove to play here, it should be to help us regain that balance if we sway too much toward the whiny side of the fence yet to support the truth when the truth is being molested by the media. Karl Rove can help conservatives and Palin supporters improve by fairly critiquing them provided he's not doing it based on an agenda. He is in a unique position to give us an insight into what the Establishment is saying so that the Palin machine can adjust for that. (Let me cut the liberals off here and explain that I’m not saying we’re not good enough and that we need improvement or that we need Karl Rove to tell us what to do. I’m saying that no matter how good you are there is always room for improvement.) Rove is going to bring us commentary that we like (like when he says Palin will be a formidable candidate and he lists the good candidates in alphabetical order so as to be unbiased and not diminish her). He is also going to say things we don’t like. When that happens, let’s hold him accountable and see if his motive is genuine (and he gives us something we can learn from) or if he is just being a mouthpiece for the Establishment. This by absolutely no means should be read to be a course changing suggestion for Palinistas. Now, more than ever, Palin supporters must be ready to do battle with and take on the Establishment, the media and the Left at every turn. As this post is being written, another hit piece by an Establishment type is being speared by the swift and surgically precise Palin army. The Palin strategy will work best if it is flexible yet sticks to principle. Think about how effective Palinistas are in their ability to get Rove's attention. What if this and the ability to turn a victorious Lisa Murkowski into one of the biggest whiners of all time puts the Establishment on its toes? What if the Establishment realizes that Sarah Palin is too big to get rid of and that they have no choice but to work with her? What if they find out they can’t beat her? As a commentator, Karl Rove will have to explain that to us (and to the Establishment who will also be listening to him) when the time is right. If that happens and he doesn’t embrace it, then we will know whether we are being thin skinned or genuinely upset about what he might be saying about Palin. Let’s help the Establishment types figure out what they figured out when they knew they couldn’t beat Ronald Reagan. We can show them that the thrill of victory far outweighs the desire and lust for power on their own terms. As much of an anti-establishment candidate Reagan was, the Establishment flourished under him. It was the prosperity and electoral victories that made them happy - even if in a self-interested way. A rising tide lifts all boats, including those obtained through the good ole boy network. This is not to make a case for crony capitalism and insider establishmentarianism. Business as usual must come to an end permanently. Our government must be run by the principles of the Constitution, not by a tyranny of statism or through the rigging of back room deals. Those who play by the insider rules of elitist power consolidation need to find our game of principled politics more attractive and more worthy a cause than theirs. It should be enough to make them want to join us. Otherwise, they must go. There can be no other way. When it comes down to crunch time, the GOP’s very existence will depend on whether or not the Tea Party can smoothly merge with and eventually become the majority shareholder in the Republican Party. It is cringe-worthy every time we hear the words “GOP co-opting the Tea Party.” That’s like saying the company should co-opt the shareholders. No, it should always be the other way around. We can work with the Establishment only when it chooses to stop tearing down our candidates not because we demand it be done on our terms, but because we demand it be done on the most effective terms. army after they shoot off about how she’s not qualified or can’t win, with every moment a commentator like Rove goes on Fox News in the aftermath of a Palin army barrage, the Establishment will eventually come to the moment in time when understanding that a President Palin is the best thing this country has on the table right now. If they realize that in time, we will win. Considering that the same type of dialogue was going on before Reagan was elected under very similar circumstances, the Establishment should come to see that history proves they are as wrong about Palin as they were about Reagan just as history proved the country wrong about electing Carter and Obama. 90% of the things the Establishment worries about won’t happen; and the other 10% they can’t do anything about anyway. The message to the Establishment is this: fear not a Palin presidency for it will be way better than you think. Palinistas, too, have lessons to be learned from this. The true enemy is the Left. The liberal Left is a despicable movement of negative people whose utopian visions of social justice and collectivism are backed up with intellectually bankrupt arguments and morally vapid core values. They do not want to simply defeat us, they want to destroy us. The most important line in Barack Obama’s inauguration speech is “On this day, we come to proclaim an end to the petty grievances and false promises, the recriminations and worn-out dogmas that for far too long have strangled our politics.” That was the moment when they had the boot on our neck and the sword held cocked above our heart. At the time this message was delivered, Sarah Palin was back in Alaska being slammed with frivolous ethics violations. Conservatism and its future leader were on the brink of being destroyed. It was just as conservatives were about to be skewered that they broke free of the submission hold and marched on Washington with their signs and Gadsden flags. Palin supporters were holding the fort for her wing of the movement until she could also free herself from the shackles. The Left’s mission was to go back to Alaska and destroy Sarah Palin immediately following the election. The conservative movement was about to be obliterated. If the Tea Party didn’t arise and if Sarah Palin had succumbed to the attacks, we’d all be living under socialism now. That’s how close we came. Imagine if Sarah Palin was never chosen by McCain. The thought is frightening. One lesson that we can take from Rove is that Palin conservatives need to develop a different reflex for those whom we fight on our side than that which we use to fight the Left. It is going to be very important that we nurture the “trembling tigers.” There are many in our movement (the conservative movement, the Tea Party movement) who are as dead set on the Constitutional commonsense principles that Palin supporters are. But some have been damaged by the media’s subliminal message that Palin is not electable. They are looking for a candidate to beat Obama and they don’t see one because they are looking right past her. Palinistas need to effectively communicate Palin’s qualifications to the rest of the movement without alienating them. They also need to make sure that the Establishment doesn’t further poison them. will ultimately need to help take back the Shining City on a Hill. These people can eventually be convinced that if you just say screw it, take a leap of faith and get behind someone, it might be better to push a bandwagon that already has an army the size of Palin’s than to set up another bandwagon right next to it. Why is it that many who aren’t sure about her yet don’t already have another horse? Leadership is the ability to make a decision, act on that decision and stick to that decision no matter what. Those folks haven’t arrived at that point in the thinking process yet. They think the water is cold. But as soon as they hold their noses and jump in, they will find it refreshing and exciting. Being a Palin supporter is a wild ride. If they can stomach it, the reward will truly be Reaganesque. To start, they’re going to get hit with the resignation thing. They’re going to get hit with the Katie Couric thing. They’re going to get hit with lies, smears, innuendos and more regurgitation of misrepresentations about Palin’s past. We need to be prepared to articulate an answer for them as quickly as we articulate an answer for the Left when they attack, only without the daggers. Don’t be quick to anger. We are in a unique position where our ability to articulate the real truth about the conservative movement includes the ability to explain why there should be no concerns about Sarah Palin becoming its leader. go down in flames. And while some may criticize her for “quitting,” intelligent people know it’s smarter to eject from the plane when it is going down so that they can live to fight again than to stay onboard and die in the crash because of fear people will criticize you for bailing out. Only an idiot would have stayed on as Alaska governor under those circumstances. Sarah Palin’s resignation is not a weakness. It is strength. Just as James T. Kirk became a starship captain in the fictional series Star Trek by beating the no win scenario, the Kobayashi Maru, Palin proved that she has the decision making abilities to make the hard choices during difficult times even if it means risking her political career to do it. This does not disqualify her for president; instead it greatly enhances her qualifications. If Sarah Palin had remained governor, she would be well over $500,000 in debt, under intense scrutiny for hawking a book while in office, criticized for moonlighting on the national stage and baggy eyed from trying to bone up on national and foreign policy as she prepared herself to become president under the covers with a flashlight and a stack of books. That Sarah Palin would not be qualified to be president. So remember the words of Ronald Reagan whose dream for us was "that you will travel the road ahead with liberty's lamp guiding your steps and opportunity's arm steadying your way." It is time to take those blue and pale pastel marbles out of your heads and replace them with red ones. 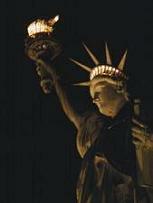 And realize that when liberty’s lamp shines in the hands of the right leader, we must follow.